With the Xbox One launching later this year, Ryse: Son of Rome looks to be one of Microsoft’s biggest exclusives. During E3 we were shown a glimpse at the game’s singleplayer portion, but the game’s multiplayer was recently showcased at Gamescom. The multiplayer portion that was shown is called Gladiator mode. It’s a cooperative experience that puts you in the Roman Coliseum to battle it out against a horde of enemies. You’ll be able to earn different unlocks to customize your gladiator. 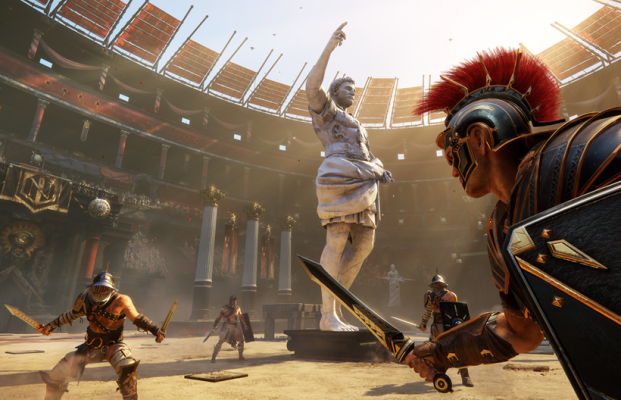 Crytek has detailed various features for Gladiator mode and we’ve included them below. Be Your Own Hero. “Ryse” offers a large variety of armor, weapons, shields, and consumables to customize your own unique gladiator. These items are earned through gold rewarded from victories in combat and impact your stats by improving your focus, XP, crowd reaction, and health. Consumables are elixirs that have a temporary effect, such as improving health or allowing instant kills. Dynamic Tile Sets. Inspired by the movable floor pieces used to re-create historic battles in the ancient Colosseum, “Ryse” uses dynamic “tile sets” of scenery to provide a continuous stream of unpredictable challenges. Scenery hidden in the hypogeum literally erupts from the floor, providing players with settings ranging from strongholds, to ruins, to naval battles. Custom Challenges and Arenas. “Ryse” allows you to create your own experiences by using the challenge editor to mix and match the maps and events into custom playlists. Each challenge has its own leaderboard and the more players who have played, the higher the reward at the end of the challenge. “Ryse will feature 11 multiplayer maps at launch, plus an additional bonus map for those who purchase the Day One edition of the game. What do you think about the multiplayer aspect of Ryse: Son of Rome? Be sure to let us know what you think by leaving us a comment below, or continue the discussion on Facebook and Twitter.